A new provision makes it unlikely that India will face sanctions over its purchase of missile air defense systems from Russia. The final version of the U.S. National Defense Authorization Act (NDAA), a compromise between the House and Senate versions of the defense bill, will grant the Trump administration authority to waive mandatory sanctions on countries under the Countering America’s Adversaries Through Sanctions Act (CAATSA) for purchasing Russian military equipment. The NDAA “Provides flexibility for strategic partners and allies to move away from the use of Russian military equipment to American equipment, while ensuring that U.S. defense and security interests remain protected, through a modified waiver under [CAATSA],” the NDAA Conference Report, published on July 23, reads. The final bill is expected to exempt three countries — India, Indonesia, and Vietnam — from sanctions under CAATSA, which was passed in August 2017 to punish Russia for reportedly influencing and manipulating the 2016 presidential election process. CAATSA came into effect in January 2018. Under the fiscal 2019 defense bill, any of the three countries, however, may still face sanctions for procuring new military hardware from Russia above $15 million, as it focuses on legacy systems. 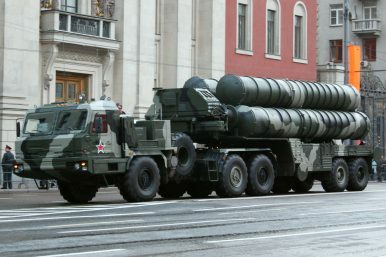 Consequently, India could still be punished should it decide to move ahead with the procurement of five regiments of Russian-made S-400 Triumf advanced Air Defense Systems (NATO reporting name: SA-21 Growler). Nonetheless, the modified waiver reduces the likelihood of sanctions. The U.S. Department of Defense in particular has been pushing for the new provision to be included in the final bill. “Doing so allows nations to build a closer security relationship with the U.S. as they continue to transition from reliance on Russian military equipment,” U.S. Secretary of Defense Jim Mattis argued in a letter to Congress on July 20. The U.S. House of Representatives is expected to vote on the final NDAA this week. The U.S. Senate will put it up for vote in August. Once the bill has been passed by both houses, the U.S. president will sign it into law. “The language [of the NDAA Conference Report] would represent a special carve-out for India on a delicate political issue,” Mukesh Aghi, the president of the U.S.-India Strategic and Partnership Forum (USISPF) was quoted as saying by the Times of India. “If enacted, the language advanced by the NDAA conference committee demonstrates the U.S. Congress’ bipartisan commitment to the U.S.-India relationship,” he added. The total contract value for the five S-400 regiments is estimated at around $5.5 billion. India and Russia reportedly concluded price negotiations in May. The signing of the contract is expected during a summit meeting between Indian Prime Minister Narendra Modi and Russian President Vladimir Putin scheduled for early October 2018.